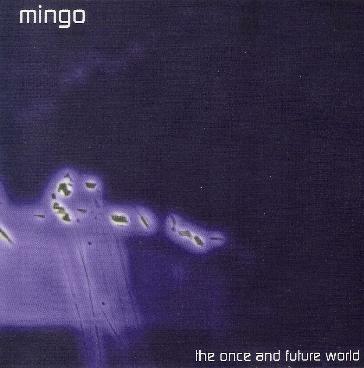 Mingo - "The Once and Future World"
As the CD began, and as the first track "Between the Wave" finished, I hoped that this thing by Mingo was going to go somewhere and not just concentrate on easily produced atmospheres that seldom strive further than what there were to begin with. The second track, "Time Turned New", however did have the same drum pattern from beginning to end, another easily produced atmosphere. But hey, that's what everyone does is it not? That is not to say that I do not like what I hear. It is more that I am sick of the same thing being produced by many a different artist claiming that it is original, but when it only simulates the great pioneers. Where is originality lying? Do not get me wrong. I love to meditate on sound. I love to lean back and relax. But I need to be taken somewhere. I need to be moved on my journey. Mingo I feel makes me bored and does not offer anything new. I am still at the start line waiting to go. The music is as it states on the bio - Ambient, Drone, Space Music. It is mellow and it is soft on the ear, but to me it drags a little. This is because the tracks are all in the same mould and they are all slow to build to nowhere. This I find a bit numbing because I did want to be taken somewhere, and was not taken far into this CD without thinking that it really offered me nothing. Call it state of mind, call it what you will. It is a definite one to be listened to in the right mood. This could be why I am not into it as much because my mood is wrong. "Complex Reaction" to me starts the most atmospheric of all the tracks, and in fact is the shortest of the tracks, lasting around 5 minutes. However I have a feeling that will not change or deviate from its original outlook. And I was right, it did not. It was the same from start to finish. I can see why Steve Roach is mentioned as an influence. He also does the same boring stuff over and over for albums and albums. And if you like Steve Roach I know that you will defiantly like Mingo. The pads and noises throughout are solid, ambient, and they are in fact nice sounds. But when each track starts similar and does not change it does get a bit boring. I mean, I listen to all kinds of long drawn out boring stuff and love it. Mingo however takes you to a point and leaves you there with no advancement further. I know that a lot of past and present artists do similar structures, and this CD fits right in there amongst them all. It is Tangerine Dream in aspects, it is well produced, and it is obviously thought out, rather than press a key and the sound will do the rest. My only qualm is that it goes nowhere. But maybe it is not meant to. I know that the sounds change but that is not what I am talking about. Regardless, I am just giving an opinion. I would have liked a bit of variation. An addition of sequencers perhaps. Possibly a variation in time to drive you along rather than a starting drone, no change and suddenly finish. For more information you can visit the Mingo web site at: http://www.sonarweb.net.